Will Facebook Be a Vector for Violence in Myanmar? Myanmar will be going online fast in the next 2 years. Right now it has the same mobile phone usage as North Korea, Eritrea, and Cuba – less than 10% – yet with Teleno, Ooredoo, and Myanmar Post and Telecommunication set to race each other to get all Burmese a mobile phone, expect the country to be connected by 2016. But are Burmese ready for the Internet? At the recent Technology Salon on “What Happens When 60 Million Burmese Go Online Overnight?” 35 thought leaders in technology and development debated just what this “big bang” would mean for Burmese culture and society, and the roles international development practitioners might play in this dramatic change. One major question was the ability of Burmese to switch from the environment of oppression they experienced under previous governments to the open, freewheeling, and even chaotic online experience. Myanmar is about to jump online without much digital or online information literacy, learned skills that take years to develop. Already, we are seeing a dramatic rise in hate speech on Facebook, where old ethnic and religious tensions are pouring forth in unchecked vitriol, often hidden behind a digital cloak of anonymity. What should international actors do about hate speech? Salon participants explored three possible actions we could take to help Myanmar transition through the first few years of Internet usage, and reach a positive relationship with the digital realm. Increase Facebook’s responsibility: Facebook has a policy against hate speech and it should enforce that policy in Myanmar, including closing accounts that break its Community Standards. Of course censoring speech is a sensitive topic, especially in a country with a history of repression, but if Facebook can ban breastfeeding photos, it should be able to ban hatemongers as well. 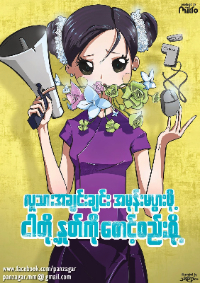 Start national dialogues: The recent Flower Speech campaign is a great example of Burmese reacting against hate speech, and we should do what we can to support these movements by building the organizing and promoting skills of those who seek positive discourse online. Let go and let Burmese self-determine: We could always take the course of non-action, of letting the Burmese people find their own relationship with the Internet. It will be interesting to see how a mainly verbal/oral culture will be changed or will change the primarily text-based Internet. Regardless of what we think, we must acknowledge the inalienable right of the Burmese people to self-determine their own future. We may help build the cyber capacity of the Burmese people, their government, and their civil society, but it’s ultimately up to them to direct their future, and arrive at whatever digital destination they desire.